Recology San Francisco is pleased to announce recipients of artist residencies for 2015. The six selected artists are Michael Arcega, Jeremiah Barber, Ma Li, Jenny Odell, Alison Pebworth, and Chris Sollars. The Artist in Residence Program at Recology San Francisco is a one-of-a-kind initiative started in 1990 to support Bay Area artists, while also teaching children and adults about recycling and resource conservation. Artists work for four months in a studio on site and use materials recovered from the Public Disposal and Recycling Area. Over one-hundred professional Bay Area artists have completed residencies. Applications are accepted annually in August. As an interdisciplinary artist, Michael Arcega works across media to create art that is informed by language, history, and geography. In his most recent work he has adopted methodologies used in the anthropological study of world cultures that often emphasize “otherness,” but Arcega turns the tables, positioning North America as ‘the other” whose symbols and rituals must be studied and understood. Though a socio-political critique, Arcega’s work also has a playful element, providing familiar entry points to alternative ways of thinking about the people who colonize the landscape. 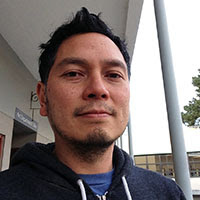 Arcega is an Assistant Professor of Art at San Francisco State University. He received an MFA from Stanford University and a BFA from the San Francisco Art Institute. In 2012, he was the recipient of a Guggenheim Fellowship. His work has been exhibited at the Asia Society in New York, Yerba Buena Center for the Arts, the Honolulu Academy of Art, and the Orange Country Museum of Art in Newport Beach. Ma Li uses non-traditional art media and discarded materials to create sculpture and installations. Her dream-like, large-scale, frequently suspended forms reference her Chinese heritage and often appear like temples, lanterns, or ceremonial architecture. But titles of works, such as Retrofuture City and 633 Hours to Intergalactica!, in combination with her materials that include vividly-colored plastics, lights, and mylar, speak to the meeting of tradition and pop culture; the ordinary and the fantastic; and the hand-made and mass-produced. She describes her works as “imbued with a sense of a celebration and a reminiscence of identity: from a woman in a collective society to a citizen of the planet.” Ma received an MFA from the San Francisco Art Institute and a BS in Chemical Engineering from Shanghai Dong Hua University. In 2014, she was the recipient of a Pollack-Krasner Foundation Fellowship. She is also the recipient of a Murphy and Cadogan Contemporary Art Award and a Knight Foundation Finalist Grant. 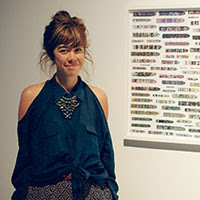 She has exhibited at SOMArts, Root Division, and Swell Gallery in San Francisco, and has been an artist in residence at the Elsewhere Museum in Greensboro, North Carolina and the Vermont Studio Center. Jenny Odell uses found imagery from sources such as Google Maps to create “portraits” of systems ranging from waste-water treatment plants to popular web searches. She has located satellite images of the factories world-wide where all the items she wore, ate or bought over the course of one day were produced, and has gathered aerial photos of 97 nuclear cooling towers together in a single image that is as aesthetically pleasing as it is disturbingly fascinating. Her work makes visible infrastructures and sources of production that play a role in our daily lives, but which are often hidden. She describes herself as “not so much a photographer as a collector.” Odell received an MFA from the San Francisco Art Institute and a BA from the University of California at Berkeley. 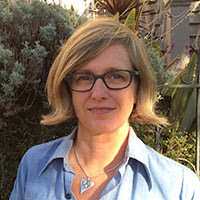 She is the recipient of a San Francisco Arts Commission Individual Artist Grant, and has exhibited at Intersection for the Arts, White Walls, and SOMArts in San Francisco, and in New York, Paris, and Barcelona. Her work has been featured in The Economist, WIRED, Frieze, and The Atlantic. Chris Sollars’ art involves the reclamation and subversion of public space through interventions and performance. His work can be experienced in two ways—through the witnessing of, or participation in, a performative event, or later viewing the documentation of the event in a gallery context via installations that combine photography, video, and sculpture. Sollars’ process is physical and conceptual as he juxtaposes dissimilar elements to create unexpected forms that are often comedic. Sollars received an MFA from Bard College and a BFA from the Rhode Island School of Design. In 2013, he was the recipient of a Guggenheim Fellowship. 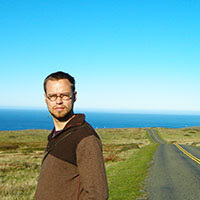 He has received a San Francisco Arts Commission Individual Artist Commission Grant, a Eureka Fellowship Award, Artadia Grant, Headlands Center for the Arts Residency, and has exhibited in venues nationally and internationally. His work is in the permanent collection of the Berkeley Art Museum and his Left Behind sculpture series was most recently published by Publication Studio in 2013. Working in performance, video, sculpture, and installation, Jeremiah Barber explores ideas of transcendence, as well as perseverance, memory, and personal mythologies. Using his own body in performances that have incorporated elements such as fire, water and smoke, Barber investigates the realms of both the physical and the metaphysical. Though elegantly minimal in their execution, his attempts at near-impossible actions also include humor and illuminate the absurdity and wonder at the core of what it means to be human. Barber received an MFA from Stanford University and a BFA from Columbia College in Chicago. 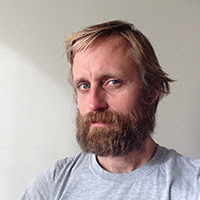 He is the recipient of a Eureka Fellowship, a San Francisco Arts Commission Individual Artist Grant, and from 2005-07 was an exhibiting member of Marina Abramovic’s independent performance group. He has exhibited at the Museum of Contemporary Art in Chicago, and in the Bay Area at Southern Exposure, SOMArts, the Headlands Center for the Arts, and The Lab. Alison Pebworth explores aspects of contemporary life and culture using the tropes and traditions of an earlier America through projects such as her Beautiful Possibility tour in which she traveled to 25 venues across the United States and Canada. Her work is equal parts social practice, public performance, and fine art exhibition, and harkens back to a time of traveling performers and sideshow curiosities. Pebworth’s projects are often long-range and involve the gathering of data to bring to light the ailments of our sped up, high tech world, for which she provides metaphorical (and sometimes actual) elixirs. Pebworth is the recipient of Artist Grants from the San Francisco Arts Commission and the Center for Cultural Innovation and has been an artist-in-residence at numerous institutions including Ucross Foundation, Claremont, WY and the de Young Museum. She has exhibited at the Museum of Contemporary Art in Detroit, the Salt Lake Art Center, in Salt Lake City, and in the Bay Area at Yerba Buena Center for the Arts, Southern Exposure and Headlands Center for the Arts. Her work is included in Rebecca Solnit’s Infinite City.